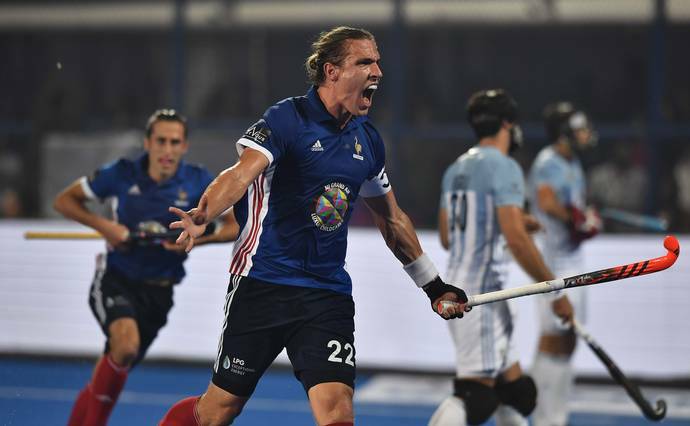 Bhubaneswar: In a high voltage match, France beat Olympic Champions Argentina 5-3 in a Pool-A match of the Men’s Hockey World Cup at Kalinga stadium here in Odisha on Thursday evening. However, Argentina are through to the quarterfinals as they top the table with six points after defeating Spain 4-3 in the first match and New Zealand 3-0 in their 2nd match. Spain is eliminated as they stand in the fourth position in Pool-A. In Pool-B matches tomorrow, Australia will face China at 5 PM and Ireland meet England at 7 PM.